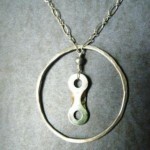 Locally made jewelry set crafted from bike parts. This entry was posted in Raffle 2010. Bookmark the permalink.